The tall, slender figure shown standing with right hand raised in vitarkamudra and left hand in varadamudra, the finely incised hair drawn up under a tiara into a tall topknot elaborately dressed with narrow braids arranged in a band and pendent loops which center an image of Amitabha Buddha seated in dhyanasana and fall to the shoulders behind the elongated earring-hung ears, wearing a jeweled and cloud-decorated necklace, foliate arm bands and a belt decorated with florets encircling the slim waist above the folded-over top of the dhoti secured by a sash drawn through a jeweled medallion into a bow, the thin fabric of the skirt falling in U-shaped folds to the bare feet and overlaid with another long sash pulled into loops at the hips before trailing down the sides, with long rectangular tabs projecting from the bottom of the feet, and with an aperture in the back and another closed aperture in the back of the skirt, wood stand with calligraphic inscription. Provenance: Sotheby's, New York, 1 December 1992, lot 192. 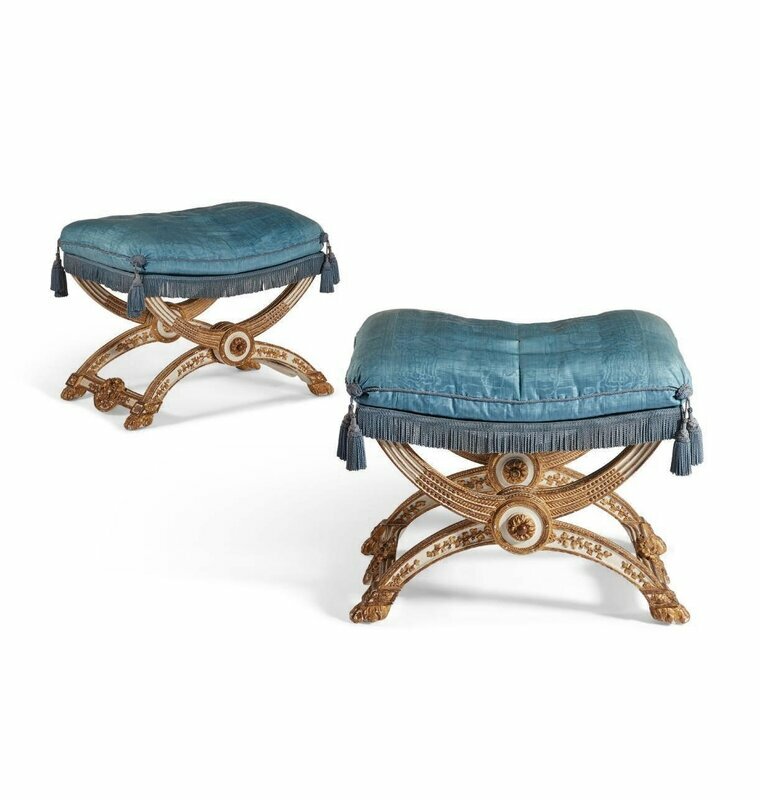 Christie's, New York, 20 September 2002, lot 193. Note: The bottom of the wood stand is carved with the seal: Taozhai zhencang, a seal of Tao Duanfang (1861-1911), a Manchu bannerman of the White, and a well-known collector. The carved inscription on the stand is dated and signed: tenth day of the eighth month of jiwei year (1919), recorded by Song Xian. The inscription is followed by one seal: Li Tang, a seal of Zhu Deni (1871-1942). 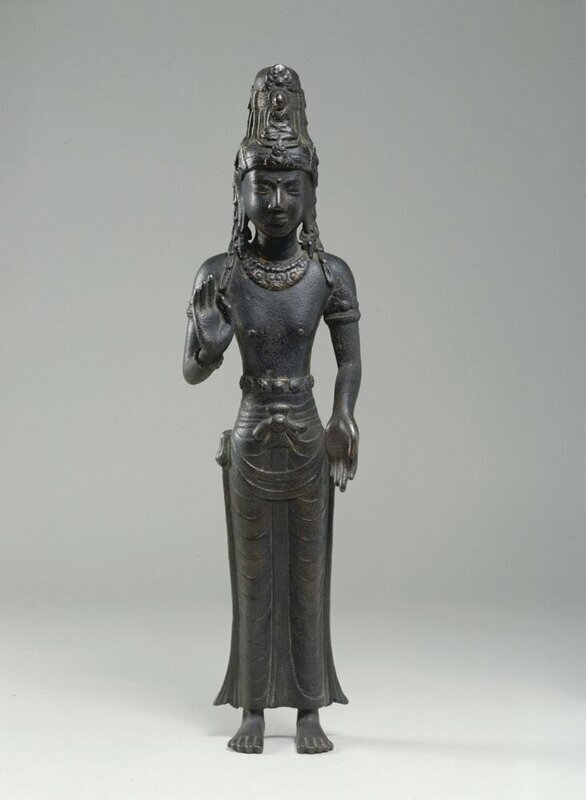 The text of the inscription gives a brief synopsis of the history of bronze Buddhist sculpture in China, reports that this piece is from Dafo Temple, in the Fen state of Shaanxi province, and praises the modeling and casting of the figure. At the time that the inscription on this stand was incised, little if anything was known about Dali or Yunnanese bronzes. It was not until the American scholar Helen Chapin identified a group of bronzes in western collections as being of Yunnanese origin, based on a scroll painting known as the Long Scroll of Buddhist Images by the 12th century Yunnanese artist Zhang Shengwen, which she published in 1944, that their origin was first realized. 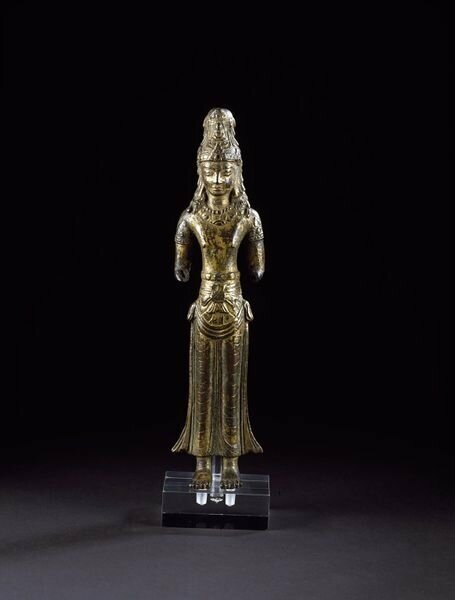 In the late 1970's restoration work at the Qianxun Pagoda, Yunnan province, uncovered a reliquary deposit which included a gold standing Guanyin similar in style to those bronzes in the West and to the present figure. The gold figure with its silver mandorla is illustrated by A. Lutz, "Buddhist Art in Yunnan", Orientations, February 1992, p. 49, fig. 6. The article goes on to identify the figure as 'Acuoye Guanyin' (Ajaya Avalokitesvara: All Victorious Guanyin), who according to legend was an Indian monk who visited Yunnan in the seventh century as an incarnation of Guanyin. 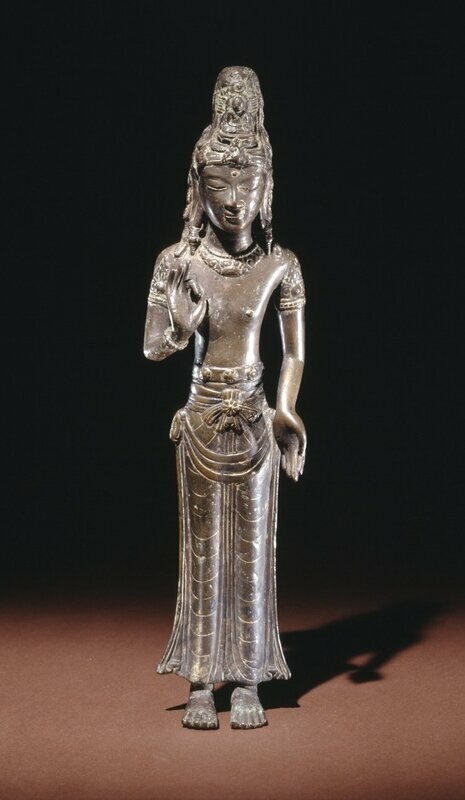 In the catalogue entry for a similar, but smaller, figure in the British Museum included in the exhibition, Buddhism: Art and Faith, British Museum, 1985, p. 206, no. 297, W. Zwalf states that these figures were made for the Dali court, appearing to have been made as talismans for the royal family. Standing figure of the bodhisattva Avalokiteśvara (Guanyin) Dali Kingdom, Yunnan province, 12th century, 1950,0215.1. © Trustees of the British Museum. A similar bronze in the San Diego Museum bears an inscription ascribing it a Yunnanese provenance and a date between 1147 and 1172. See H. Chapin, "Yunnanese Images of Avalokitesvara", Harvard Journal of Asiatic Studies, vol. 8 (1944-5), pp. 131-86, pls. 3-6. Compare, also, the equally fine figure included in the exhibition, Treasures from the Metropolitan Museum of Art, China House Gallery, New York, 24 October-25 November 1979, no. 22; and two others from the Musée Guimet and the Freer Gallery of Art illustrated by H. Munsterberg, Chinese Buddhist Bronzes, Vermont and Japan, 1967, pls. 58 and 59 respectively. Both Chapin and Munsterberg discuss the Indian influences visible in these figures: the bare chest, slender body, tight-fitting skirt and conical hair treatment. Lutz also, op. cit. p. 48, refers to these bronzes as the "only sculptural form in Yunnan whose origins can be traced back to Southeast Asia". Bodhisattva Avalokiteshvara (Guanyin), Dali kingdom (938–1253), 12th century. Gilt arsenical bronze; lost-wax cast. H. 20 3/4 in. (52.7 cm); W. 6 1/2 in. (16.5 cm); Diam. (base) 6 1/2 in. (16.5 cm). Gift of Abby Aldrich Rockefeller, 1942, (42.25.28). © 2000–2018 The Metropolitan Museum of Art. Other figures of this group have also been published: one in the Brooklyn Museum illustrated on the cover and inside the brochure for the Asian Art Council; one (missing its forearms) in the Victoria and Albert Museum, illustrated by R. Kerr, Chinese Art and Design: Art Objects in Ritual and Daily Life, Woodstock, New York, 1991, no. 37; one in the Sumitomo Collection illustrated by S. Umehara, Shin-Shu Sen-Oku Sei-Sho, Kyoto, 1971, p. 180, no. 255; one in the Asian Art Museum of San Francisco illustrated in Chinese, Korean and Japanese Sculptures in the Avery Brundage Collection, Japan, 1974, pl. 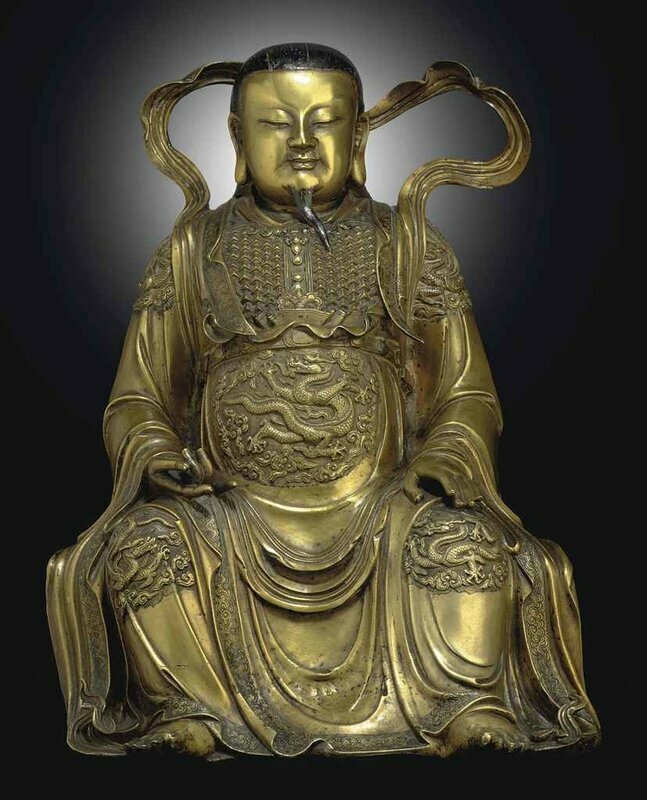 140; one in the National Palace Museum, illustrated in the catalogue, A Special Exhibition of Recently Acquired Gilt-Bronze Buddhist Images, Taipei, 1996, no. 15; and one in the Yunnan Provincial Museum, included in the exhibition, Gems of China's Cultural Relics, Beijing, 1990, no. 160. See, also, the similar and slightly larger figure (18 3/8 in.) sold in these rooms, 19 September 2007, lot 188. 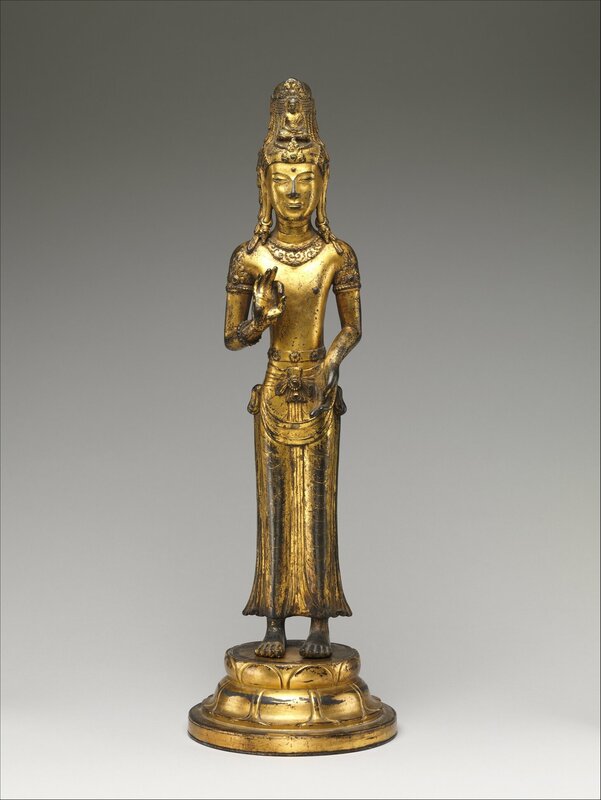 Guanyin Acuoye, Yunnan province, 1200-1250, Gilt bronze, Height: 28.5 cm. Purchased with Art Fund support, the Vallentin Bequest, Sir Percival David and the Universities China Committee (M.155-1938). © Victoria and Albert Museum, London. The bodhisattva Avalokiteshvara (Guanyin), China, Yunnan province, Dali kingdom (937-1253), Bronze with gilding, H. 17 1/2 in x W. 4 5/8 in x D. 3 in, H. 44.5 cm x W. 11.8 cm x D. 7.6 cm, The Avery Brundage Collection (B60S34). © Asian Art Museum Chong-Moon Lee Center for Asian Art and Culture. The result of Oxford thermoluminescence test no. 666f17 is consistent with the dating of this lot.